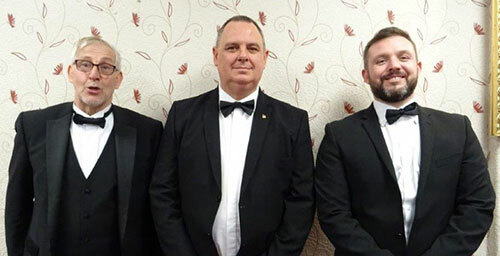 Some 52 brethren met at Cleveleys Masonic Hall to witness Howard Shaw being installed into the chair of Thornton and Cleveleys Lodge No 3854 for the second time in what proved to be a sparking demonstration of ritual. All the brethren were delighted to receive Ted Rhodes as their principal guest, together with Past Assistant Provincial Grand Master Harry Cox, fellow grand officers; North Fylde Group Chairman Peter Greathead, Duncan Smith, assistant group chairman John Cross and John Pitches. Mark Tomlinson, the WM and installing master, and a former member of the RAF dealt with the early business of the lodge with military precision, his mastery of ritual set the stage for the following installation. Mark asked Alan Fairhurst to occupy the senior warden’s chair, Roger Lloyd-Jones to occupy the chair of the junior warden and Jim Thompson to act as installing inner guard. The master elect was presented by Eric Peat who proposed Howard as a joining member of the lodge and presented him as master elect at his first installation in Thornton and Cleveleys Lodge in 2002. Howard was then installed with great sincerity by Mark Tomlinson. The working tools were presented by a trio of ‘light blues’; the third degree tools by David Hodge, the second degree tools by Mark Spragg and the first degree tools by Jonathan Davies. Eric Peat fittingly delivered the address to the master, with the address to the wardens given by Gordon Major, the address to the stewards by Provincial Grand Steward John Pitches. The presentations were completed by Ted Rhodes delivering the all-important address to the brethren of the lodge. The working tools ‘dream team’: Jonathan Davies (left), Mark Spragg and David Hodge (right). Once the ceremony of installation was complete, Ted Rhodes rose to bring the greetings of the Provincial Grand Master Tony Harrison to the new master and the brethren of the lodge. At this point, Howard presented Ted with cheques for £300 to the 2021 Masonic Charitable Foundation, £300 to the Grand Theatre Trust, £300 to Barnardo’s, £150 to Macmillan Nurses, £50 to Cats Paws, £300 to Combat Stress. In addition the lodge has, over the year presented a further £3,000 to the MCF 2021 Festival, £300 to the West Lancashire Freemasons’ Charity, £100 to the Swallow Dale Children’s Trust, £50 to the Blackpool Society for the Blind, £50 to the Blackpool Society for the Deaf, £100 to Donnas Dream House, £127 to Children with Cancer September Push and £127 to the Rosemary Cancer Foundation plus £1,000 to Cleveleys Masonic Hall. Ted congratulated the lodge for raising such amazing amounts for charity. 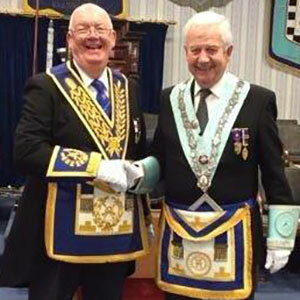 In responding to their generosity, Ted also congratulated the brethren of the lodge who had taken part in the ceremony, saying that he had witnessed a sparkling ceremony filled with ritual that he had never seen before. He thanked Peter Greathead and the group officers for their hard work and congratulated those within the group who had received promotions. Ted also expanded on the subject of the MCF 2021 Festival saying that it was important to support the festival by purchasing the steward’s jewel and wearing it with pride. Picture left: Howard Shaw (left) being toasted by Peter Bowden and Roger Lloyd-Jones (right) during the master’s song. Picture centre: Howard Shaw shares a drink with his installing master Mark Tomlinson (right). Picture right: Ted Rhodes (left) receives flowers for his wife Breda, from Howard Shaw. The brethren then enjoyed a superb festive board at which a raffle took place and raised the magnificent sum of £380 for charities. The toast to the health of the newly installed master was given by immediate past master Mark Tomlinson and the master’s song was rendered by lodge secretary Roger Lloyd-Jones joined by Peter Bowden, accompanied by Steve Lloyd. Sandy Wall closed the evening with style by delivering the tyler’s toast.